Co Donegal farmer Gareth Lamberton (25) won the heart of Coleraine girl Eleanor McCollum (24) after being matched in a 'Take Me Out' charity night - and Gareth continued the showbiz theme with his epic proposal. Beckoned onto the stage as Dublin band Kodaline sung their hit song The One at their gig in Belfast's Custom House Square, Eleanor, who works in marketing, said 'yes' in front of the crowd of 5,000. And she was left so stunned by the proposal that she can't remember anything more of the concert - despite spending the rest of the night in the VIP zone back stage. "You could say it was a bit of a shock," Eleanor told the Belfast Telegraph. "But now I've had a little time to think about it, Gareth was behaving a bit strangely all day. "When I met him off the train during the day he left me to go to the toilet and disappeared for an hour. It turns out he'd gone to Custom House Square to make sure everything was going to go as he planned." It's been two years, three months and four days since the couple first met at the Balmoral Show in May 2016, and they clicked shortly afterwards when they were paired up with a restaurant voucher during a charity 'Take Me Out' night in Strabane. "He's never been the sort of person to do stunts like this," said Eleanor. "He works on the family dairy farm with his brothers so it was very unexpected. "It took a lot of convincing for me to get to the concert, but my best friend Rachel Nelson from Ballyclare was in on this from the start and persuaded me I had to go with her. She was the only other person he'd told. "Gareth was frantically texting at the start of the concert. I wondered who he was sending messages to but Rachel told me not to be so nosy. "Then they told me I'd won a competition to go back stage so I was lined up there with Gareth at the side of the stage as the band started to play 'The One'. "It turns out he'd gone to buy the engagement ring that morning and had everything planned. After all that I was always going to say yes. All credit to Gareth, he couldn't have planned it any better. 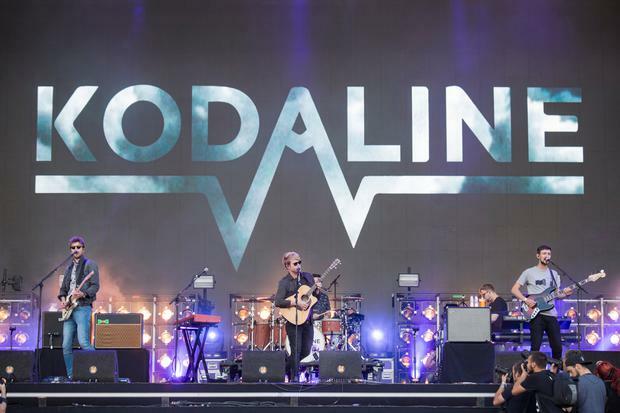 We've asked them [Kodaline] to be our wedding band, but I'm not sure if we'll be able to afford them!" The couple didn't have much time to celebrate as Gareth jetted off to Canada yesterday. "He's off on a road trip with his brothers," said Eleanor. "Maybe he thought I'd have something to say about Thursday night! "We'll get down to wedding planning when he gets back, but I hope to have a bit of a say in that. I've no idea what he might come up with!"